One remarkable symptom of scurvy, that constant bane of the Age of Discovery, was the acute and morbid heightening of the senses. Jonathan Lamb explores how this unusual effect of sailing into uncharted territory echoed a different kind of voyage, one undertaken by the Empiricists through their experiments in enhancing the senses artificially. 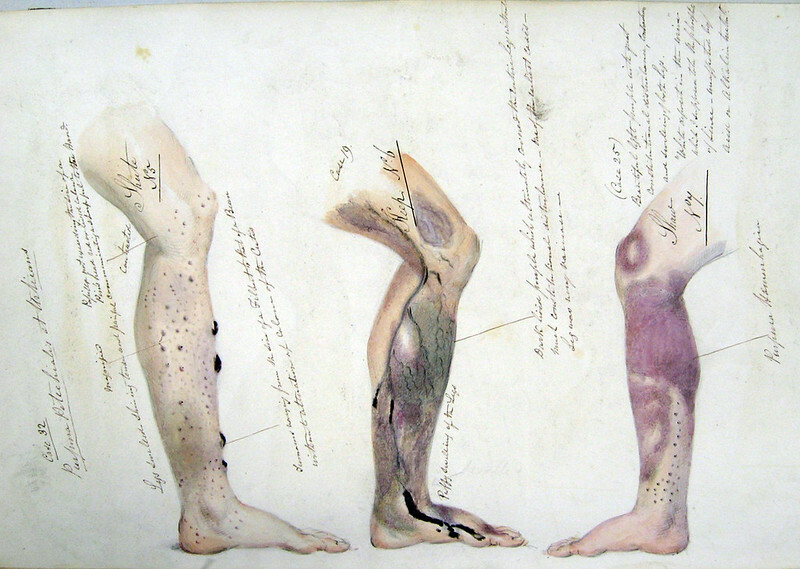 A page from the journal of Henry Walsh Mahon showing the effects of scurvy, from his time aboard HM Convict Ship Barrosa (1841-2) — Source. When the archangel Michael in Milton’s Paradise Lost explains to Adam that his sin cannot be purged in Paradise, but must be worked off over time in the world at large, he opens a door to discovery that is at once promising and depressing. On the one hand there is the whole earth to traverse and to exploit, and on the other Adam is reminded that he is about to infect it with the taint of mortality. Two sides of discovery are exhibited, then: the prospect of a purer knowledge waiting to be found (the route to ultimate redemption), and the awareness of a degenerate constitution (“a distemper gross to aire as gross”) revealed to Adam as a terrestrial future filled with “th’effects which thy original crime hath wrought”. The scientists who ushered in the last era of maritime exploration were charmed by the promise of discovery. Robert Hooke wrote, “And as at first, mankind fell by tasting of the forbidden Tree of Knowledge, so we, their Posterity, may be in part restor’d by the same way . . . by tasting too those fruits of Natural Knowledge, that were never yet forbidden”.1 But no matter how many devices Hooke and his colleagues invented to advance this project, there was a distemper infecting all attempts to put it into practice. Scurvy. Caused by a genetic mutation that prevents humans from synthesising vitamin C, scurvy was inevitable in long voyages of discovery where fresh food was hard to get, causing the body to grossly disintegrate and perish. The disease ensured that the sinister ambiguity of discovery, so cheerfully overlooked in Hooke’s program of restoration, remained intact. If sin came into the world via knowledge and discovery could it really leave the same way? Scurvy seems to indicate, like God, that it can’t; and yet there is another way in which it suggests, like Hooke, the opposite. One of its more remarkable symptoms was a morbid receptivity to sense impressions, one aligned with the preternatural sensitivity scientists were trying to excite artificially. If scurvy is construed as physical manifestation of sin — a consequence of the postlapsarian body, the offspring of illicit knowledge — it has its own interest in the processes of empirical cognition. An allegory for the sense of touch, featuring Adam and Eve being ejected from the Garden. 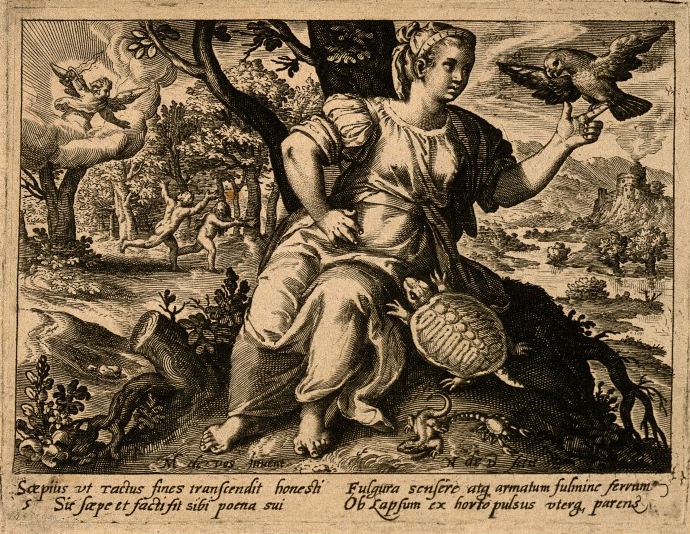 Engraving by N. de Bruyn after M. de Vos — Source: Wellcome Library. Spectacular novelties such as coral grew more wonderful for Matthew Flinders as scurvy heightened the impression, turning dangerous animate rock into fascinating antiscorbutics: “We had wheat sheaves, mushrooms, stags horns, cabbage leaves, and a variety of other forms, glowing under water with vivid tints of every shade betwixt green, purple, brown, and white”.6 Pleasure and disgust could be aroused by the selfsame phenomenon: Johann Reinhold Forster was fascinated by the effects of phosphorescence although he believed it was caused by rotting animalcules. One hundred fifty years later years later, Robert Louis Stevenson was to have the same mixed reactions to coral. The sea snakes in The Rime of the Ancient Mariner excite similar extremes of wretchedness and rapture. 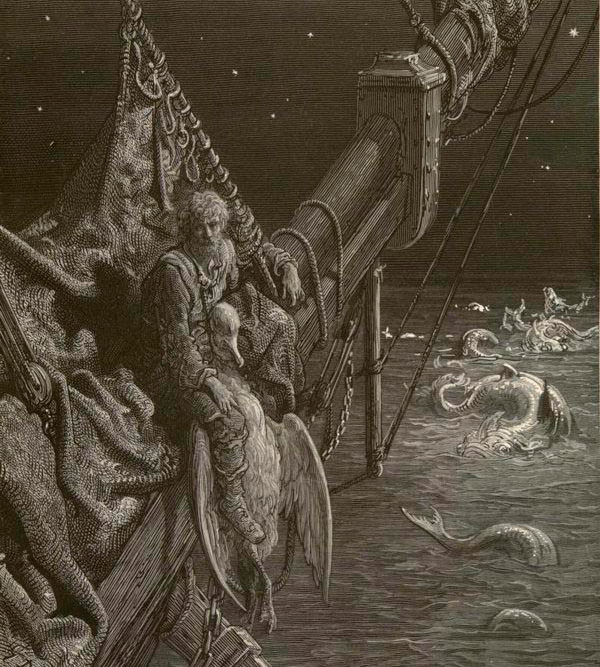 “I watched the water-snakes” (1877), illustration by Gustave Doré for Coleridge’s Rime of the Ancient Mariner — Source. In the previous century scientists had attempted various prostheses for the sense-organs designed to make the work of discovery more exact: telegraph wires to transport the voice to distant ears, hygroscopes for detecting effluvia leaking from the earth, and of course improved microscopes and telescopes designed to bring the infinitely small and the infinitely distant into distinct focus. Hooke’s reactions to the colours and shapes of microscopic specimens were sometimes quite as ecstatic as Sparrman’s, Flinders’ and De Queirós’, but at the same time he was able to make accurate drawings of them that had never been seen before. In this pursuit he explained how the senses were “wonderfully benefitted . . . and guided to an easie and more exact Performance of their Offices”.7 If other people were using ships, huge machines designed to bring the unknown into the purview of the five senses, Hooke was using his own portable contrivances to arrive at what he explicitly referred to as a discovery of “new Worlds and Terra-Incognita’s”.8 His machines were the forerunners of those that accompanied Cook’s supercargoes: Kendal’s and Arnold’s chronometers, Knight’s azimuth compass, and Bird’s astronomical quadrant. Support for Hooke was by no means unanimous. Margaret Cavendish said his instruments could never penetrate the surface of things and find out the secrets of their constitution; they only disarranged the distances, textures, and angles that made them usual or comely, revealing instead the immodesties, moles, and hairs that cause the maids of honour in Brobdingnag to appear so repulsive to Gulliver. Were we to see things a thousand times more clearly or hear things magnified at the same rate, our lives would be made intolerable, Locke argued: there would be no rest, no power of discrimination. Such a witness would live “in a quite different World from other People. Nothing would appear the same to him, and others”.9 For Hooke, temporary alienation from the familiar world was the whole point. If a terra incognita was to be disclosed, then one had to act in the spirit of foreignness: “An Observer should endeavor to look upon such Experiments and Observations that are more common, and to which he has been more accustom’d, as if they were the greatest Rarity, and to imagine himself a Person of some other Country or Calling, that he never heard of, or seen the like before”.10 Scurvy, you might say, helped the observer into this estranged position. A flea as seen through a microscope, in Hooke’s Micrographia (1665) — Source. 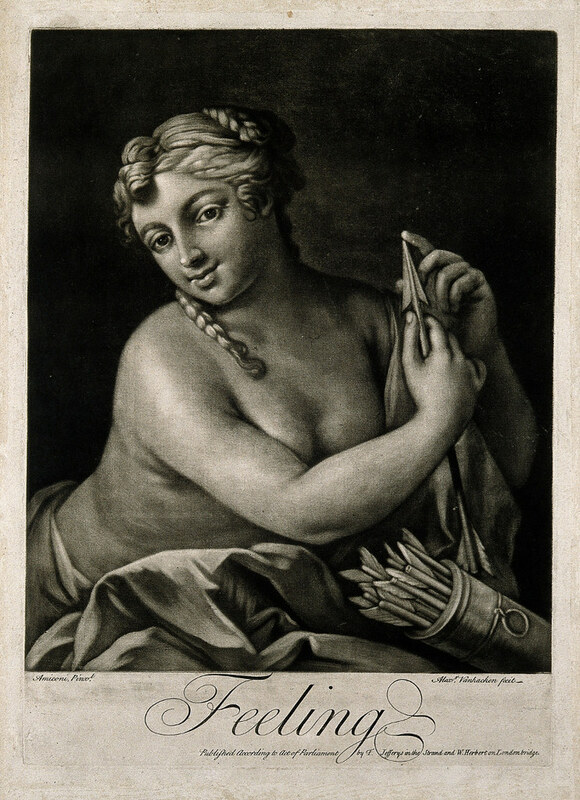 A female figure feeling an arrow with her finger; representing the sense of touch. Mezzotint by A. Vanhacken after J. Amiconi — Source: Wellcome Library. T’inspect a mite, not comprehend the heaven? To smart and agonise at every pore? 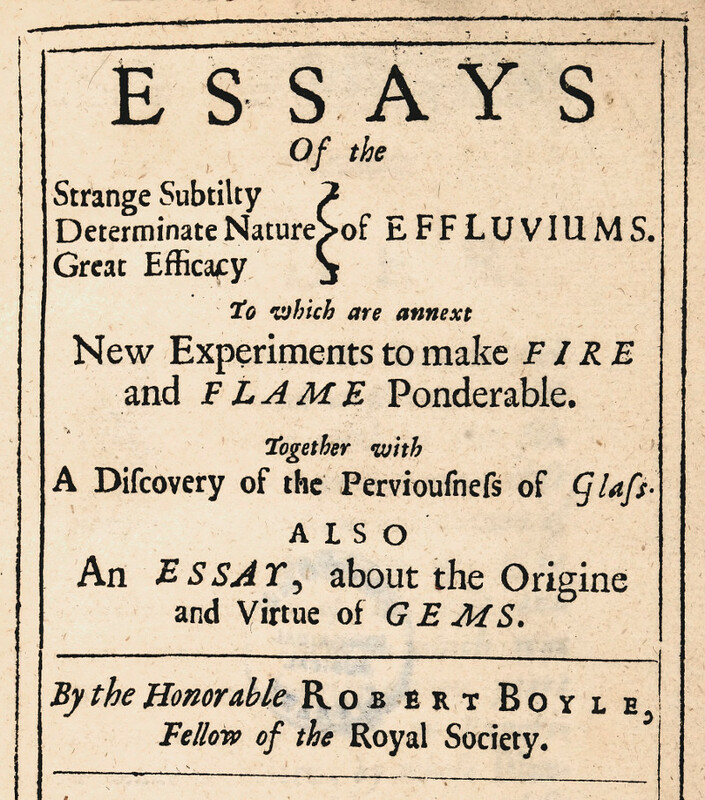 Approaching the matter of acute sensation from a different angle, Robert Boyle saw a very useful connexion between disease and extraordinary powers of perception. In his essays on effluvia, he mentions several examples, some of an innate susceptibility (the lady who swoons at the smell of roses) and some of a valuable acquisition of sensibility after an illness. A man who recovered from bubonic plague found himself able to smell an infected person before any signs of the pestilence had appeared; another who suffered inflammation of the eyes and afterwards could distinguish colours in the dark; a physician who fell sick of a fever and discovered he could now overhear whispered speech at a great distance.19 Boyle’s explanation for these accidental improvements of the subtlety of the senses stems from his belief that effluvia do not bounce off the body, but pierce it and, by affecting its sensory equipment, alter the organs of the body that influence subsequent reactions to their environment. So from a blind and involuntary susceptibility, the body’s organs may advance to an alertness that is active and what Bacon would call ejaculative or emittent. From this superlative awareness of effluvia, Boyle supposes such a degree of potential discrimination that the size, shape, motion, and colour of effluvia themselves might become perceptible. So by means of the variations in the internal constitution of the living engine (as Boyle calls the body) he aims at the discovery of an invisible world of particles, just as Hooke with his machines goes in search of a terra incognita in the bottom of a microscope, or Coleridge beneath the porous surface of the skin. Detail from title page of Boyle’s Essays of the Strange Subtilty, Great Efficacy, Determinate Nature of Effluviums — Source: Wellcome Library. But then when the desideratum is materialized, what a remarkable shift from miserable privation to intense pleasure! “The patient in the inveterate stage of the disease seems to gather strength even from the sight of fruit: the spirits are exhilarated by the taste itself, and the juice is swallowed, with emotions of the most voluptuous luxury”.22 John Mitchel, an Irish political prisoner en route for Tasmania aboard a scorbutic transport, wished never to forget the “brutal rapture” with which he devoured six oranges when the ship landed in Pernambuco. There is a gentler example of corroboration when the parched Ancient Mariner wakes from a dream of drinking to find his thirst quenched by the rain falling on his bare skin: “Sure I had drunken in my dreams,/ And still my body drank”. 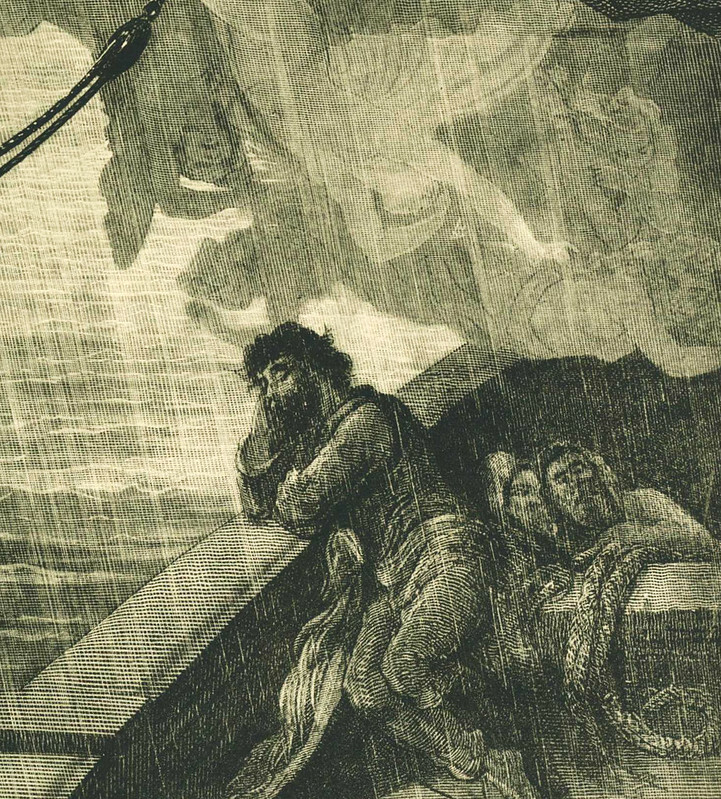 “The rain poured down from one black cloud” (1877), detail from an illustration by Gustave Doré for Coleridge’s Rime of the Ancient Mariner – Source. Was this universe Boyle’s invisible world? Hooke’s terra incognita? The corroborative assignation with fresh fruit on a desert island? Probably not, for it was experienced, as Coleridge himself was aware from his experiments with opium and laughing gas, with all sense of “outness” lost: and then, as he says, “What a horrid disease every moment would become”.26 Scurvy was a terrible affliction but was not that kind of distemper. It maintained some link with the real, for no matter how foreign and extravagant it might appear in a dream, it was an authentic message from the body to the imagination, to which the imagination and the will did their best to respond. Erasmus Darwin called reveries and delusions resulting in total disobedience to external stimuli “diseases of volition”, and we can conclude that scurvy was not of that genus because its morbid sensory alertness preserved (no matter how obliquely) some kind of faith with the empiricist principles that shadowed its history. , (Pickering and Chatto, 2009). An Essay on the Sea Scurvy (1753), by Anthony Addington. Observations on the scurvy : with a review of the theories lately advanced on that disease ; and the opinions of Dr. Milman refuted from practice (1793), by Thomas Trotter. An Inaugural Essay on Scurvy (1798), by John Claiborne. A Treatise on the Scurvy (1772), by John Lind. The voyages of Pedro Fernandez de Quiros, 1595-1606 (1904), edited by Clements Markham. Essay on Man (1843 edition), by Alexander Pope. Micrographia (1665), by Robert Hooke. The philosophical works of the Honourable Robert Boyle (1725), edited by Peter Shaw. The Rime of the Ancient Mariner, by Samuel Taylor Coleridge. Lamb delves into the writings of South Seas explorers, illuminating the European age of exploration through the distracted and infatuated feelings of the explorers themselves, as well as the contemporary audience’s interest in their narratives. The cure for scurvy saved lives and changed the course of sea battles. In this book – a fusion of history and adventure story – Brown tells of how James Lind, James Cook, and Gilbert Blane worked to eradicate scurvy. An exploration into the fascinating history of how 18th-century exepriments into nitrous oxide (AKA laughing gas) led to improvements in anesthetic surgery and influenced our modern drug culture. Ackerman takes us on a grand multi-disciplinary tour in which philosophy and physiology come together in a series of essays exploring the five senses.